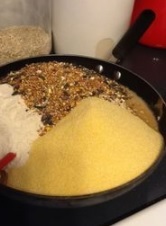 This is an easy bird food recipe for young and old to make. Melt the lard and peanut butter together. Add the cornmeal and flour to the melted peanut butter and lard. Put on a tray feeder, in a suet cage, or in a tin can. Now place it outside for your birds to enjoy! If you make the whole recipe and have too much, it freezes very well.